The Energy SuperStore Hub is pleased to present the UK energy storage research capability document. 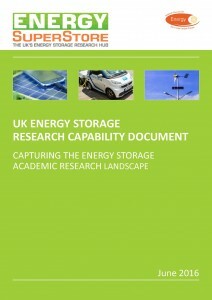 This document aims to share a summary of UK’s academic capability in Energy Storage Research. Over 100 academics participated and we hope that this document will stimulate collaboration across the sector. If you are a UK-based academic working in the energy storage arena and wish to be included, please contact Dr Thomas Esterle at thomas.esterle@materials.ox.ac.uk. The Energy Superstore Hub is supported by funding from the Engineering and Physical Sciences Research Council as part of the Research Councils UK Energy Programme.